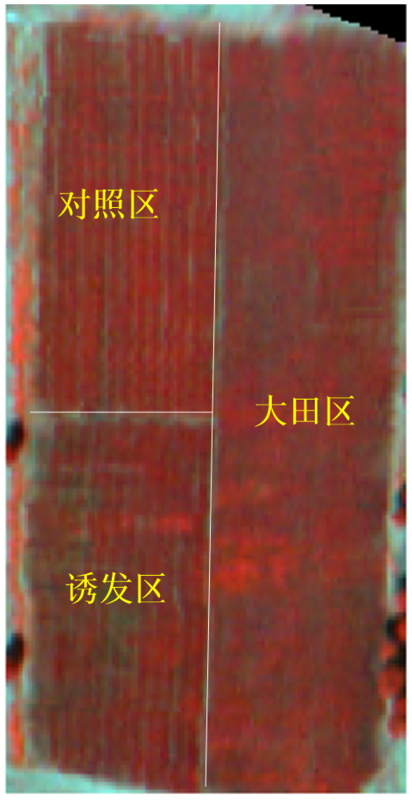 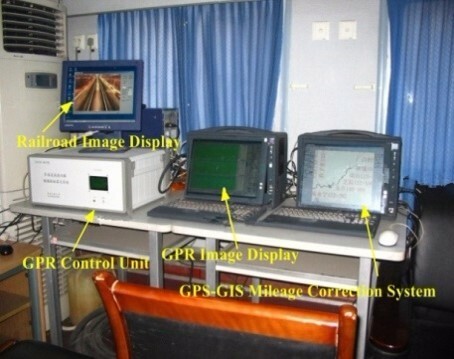 Development of train-mounted GPR techniques is the need of rail transportation safety, especially high-speed railway transportation safety. 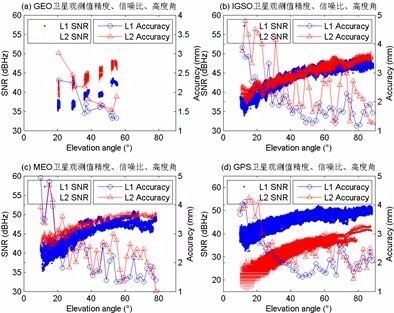 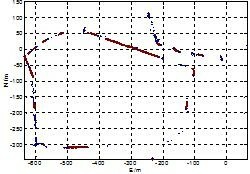 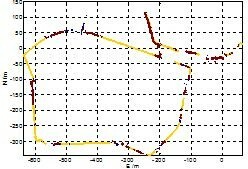 Research Center for Vehicle-mounted GPR Detecting Technique can provide necessary modern equipments for regular inspecting high-speed railway subgrade and tunnels. 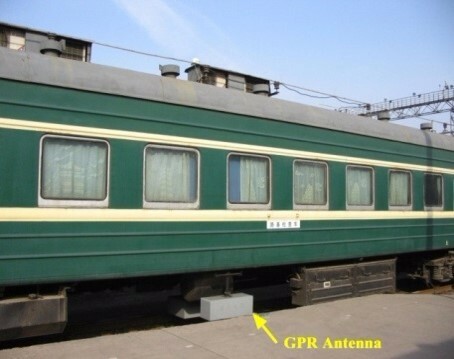 The objective of Research Center is to develop multi-purpose vehicle-mounted GPR system on the basis of the existing train-mounted GPR, gradually developing a series of air-launched antennas with high, middle and low center frequency, forming full-covered detecting techniques from shallow detection to deep probing, which can meet the needs of high-speed rail track structure and subgrade inspection for unfavorable geologies and collect the underground information. 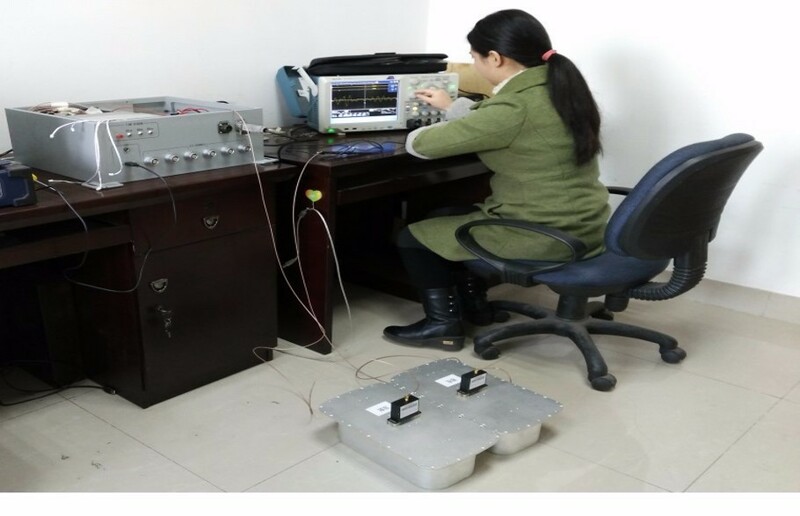 In addition, vehicle-mounted GPR system will be widened to the subways, highways and other transportation areas from railway roadbed and tunnel inspection. 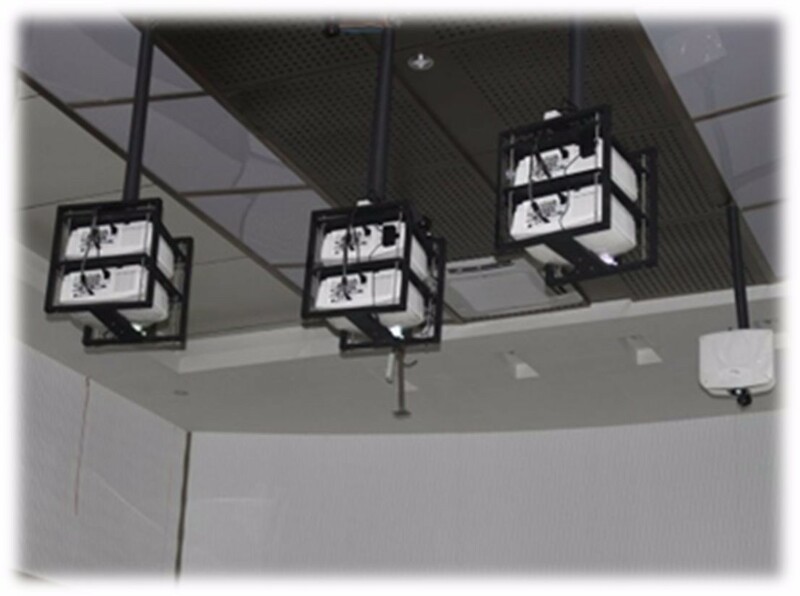 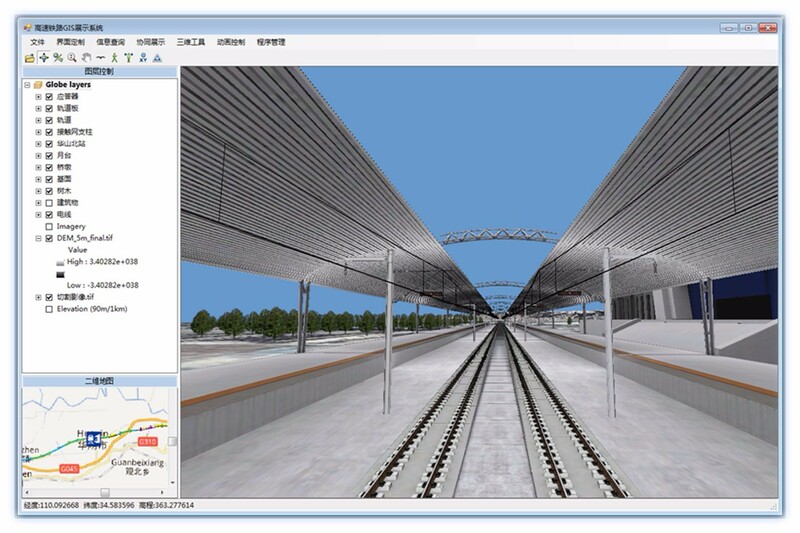 ●In 2006, we developed China's first subgrade condition inspection car for railway speed-up section. 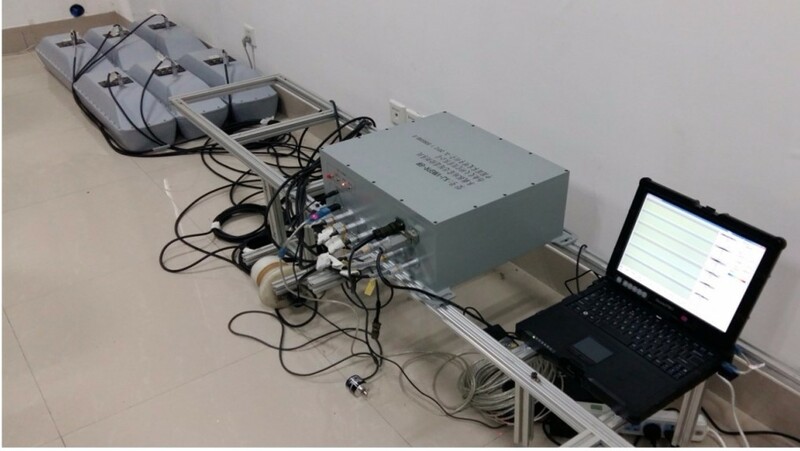 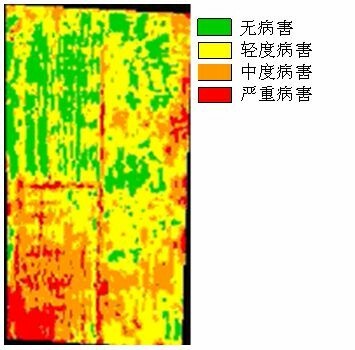 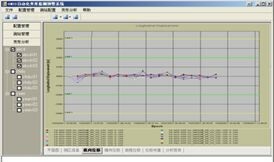 ●In 2008, we developed the train-mounted multi-channel GPR system with high-speed scanning and data acquisition software as well as data processing software, whose testing speed can be reached 175km/h. 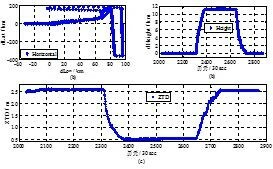 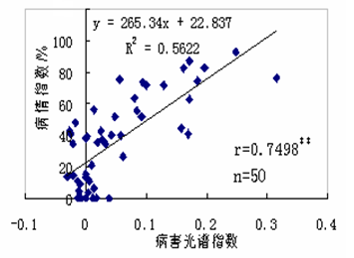 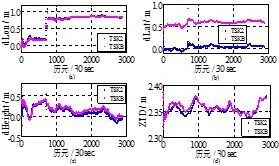 Moreover, the detecting speed of this system is faster than that of the similar foreign products under the same conditions. 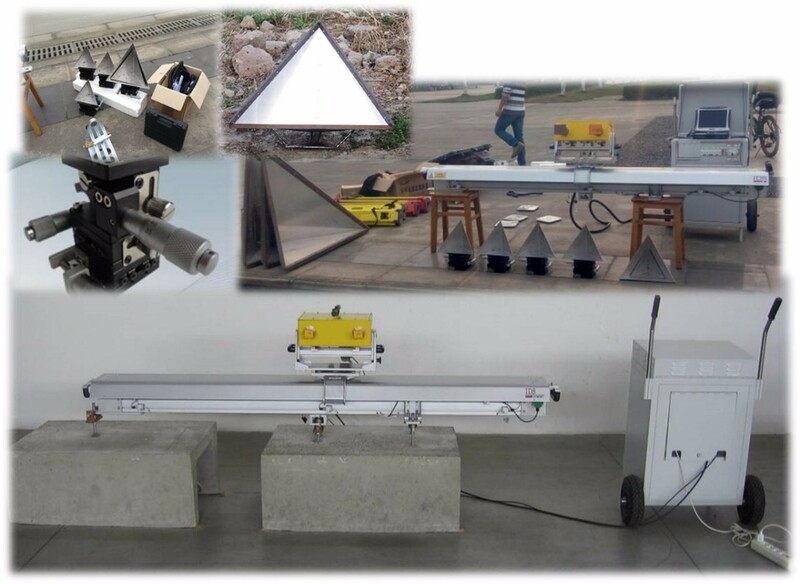 ●In 2012, we developed the vehicle-mounted GPR system for detecting railway tunnel, whose detecting speed is 80km/h～175km/h. 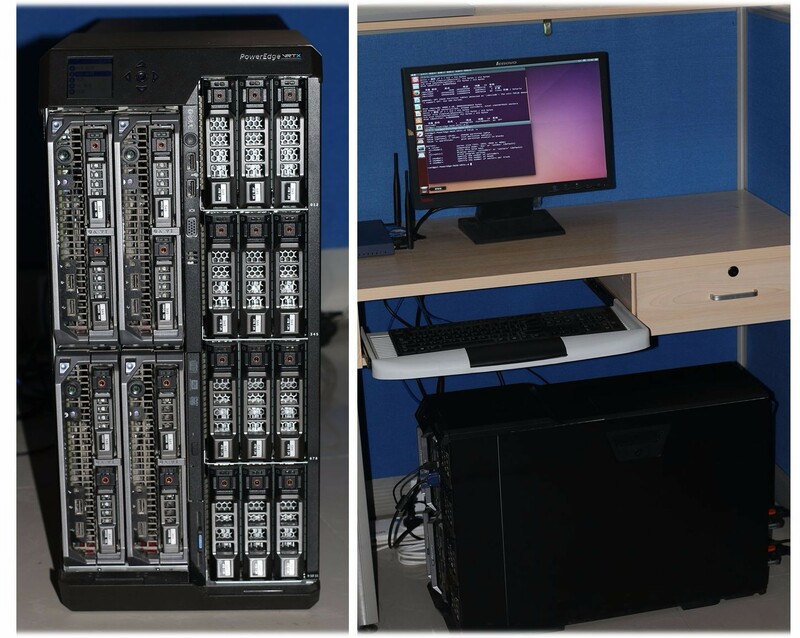 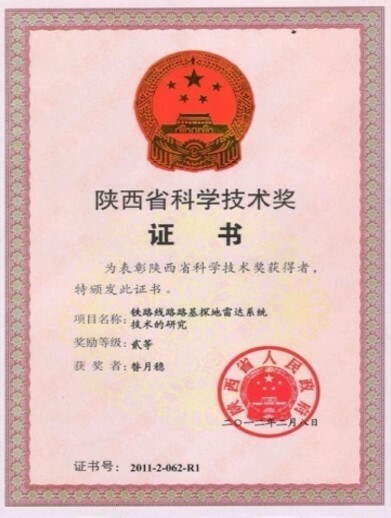 In support of the State-Province Joint Engineering Laboratory in Spatial Information Technology for High-speed Railway Safety, the Technical Support Center for Sichuan Provincial Remote Sensing Data Center was established by SWJTU in July 2015. 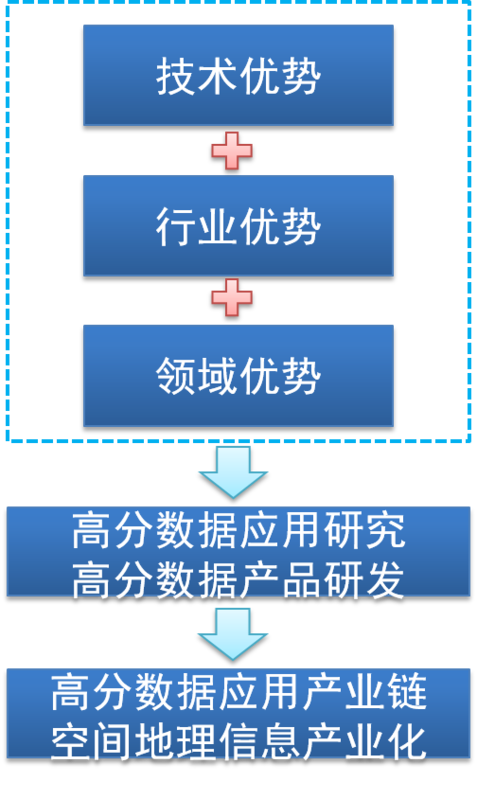 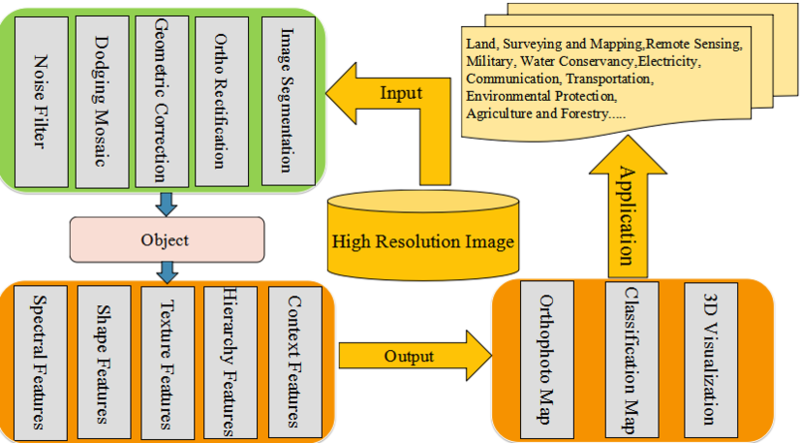 The center focuses on (1) promoting data use of China High-Resolution Earth Observation System (CHEOS), (2) building the local supporting system and specialized platform for applications of CHEOS, (3) offering professional training for different applications of the relevant data use, and (4) providing applicable solutions based on our research results for CHEOS data processing and application services for the public administration and various enterprises. 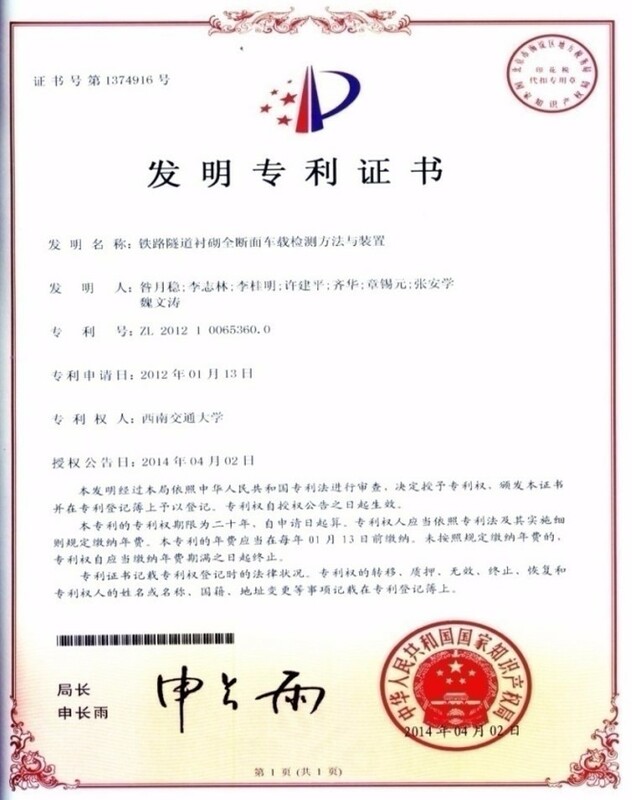 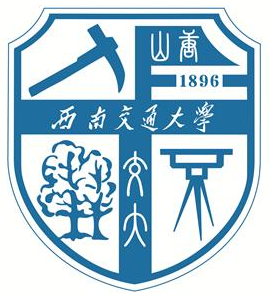 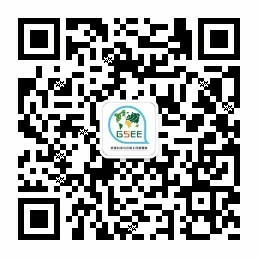 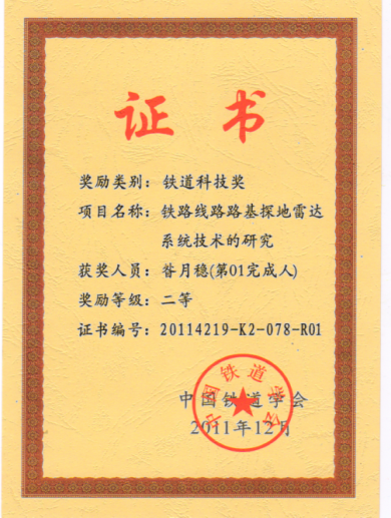 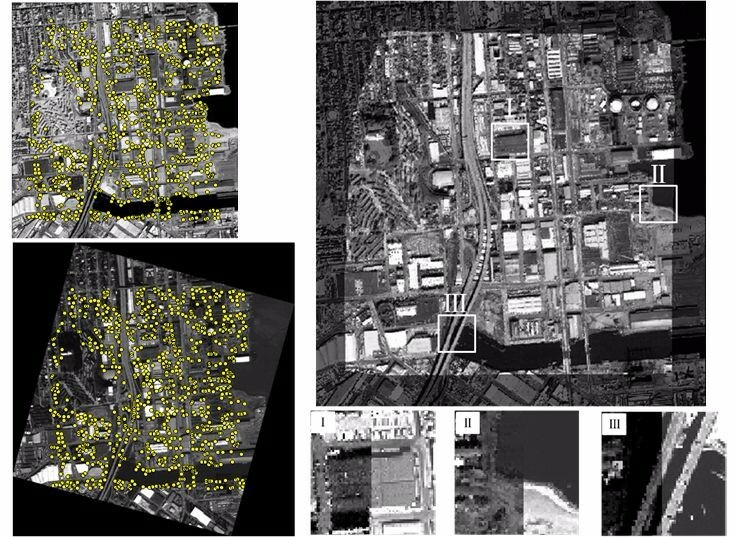 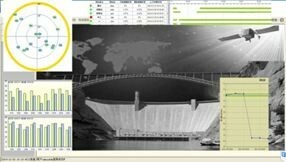 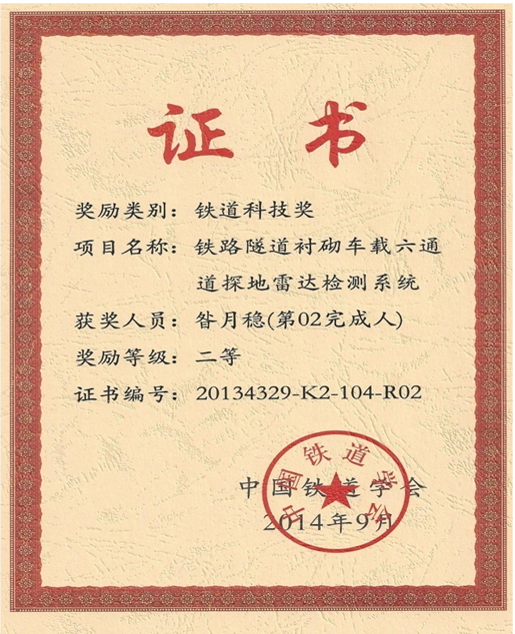 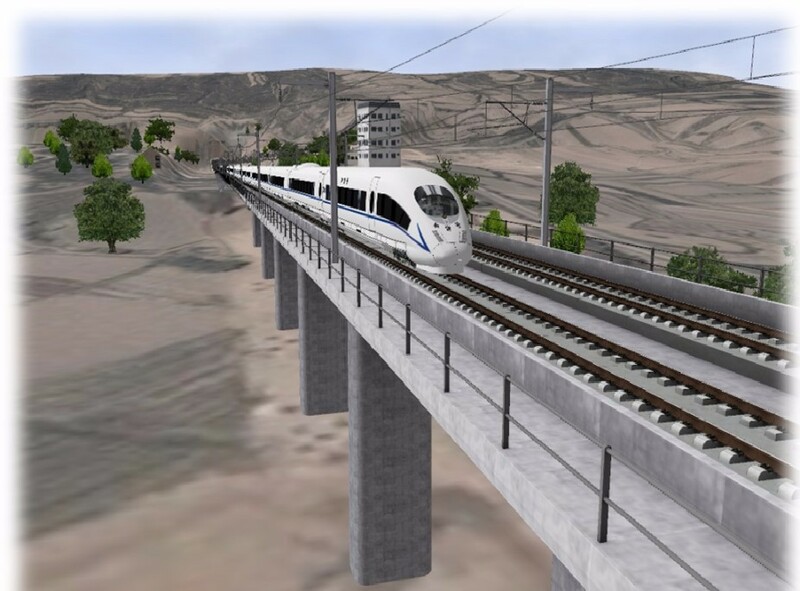 In support of the State-Province Joint Engineering Laboratory in Spatial Information Technology for High-speed Railway Safety, the Research Center for virtual geographic environment along high-speed railway concentrates on investigation of the theory and technologies of virtual geographic environment modelling and analysis. 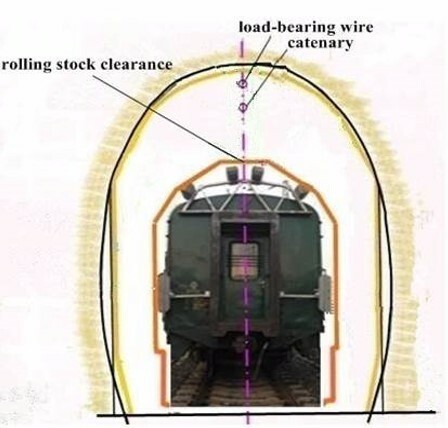 At different stages of the entire life cycle of high-speed railways (e.g. 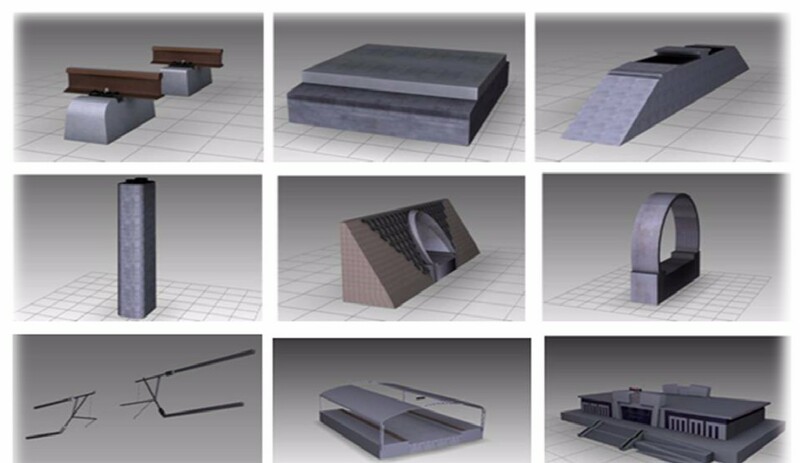 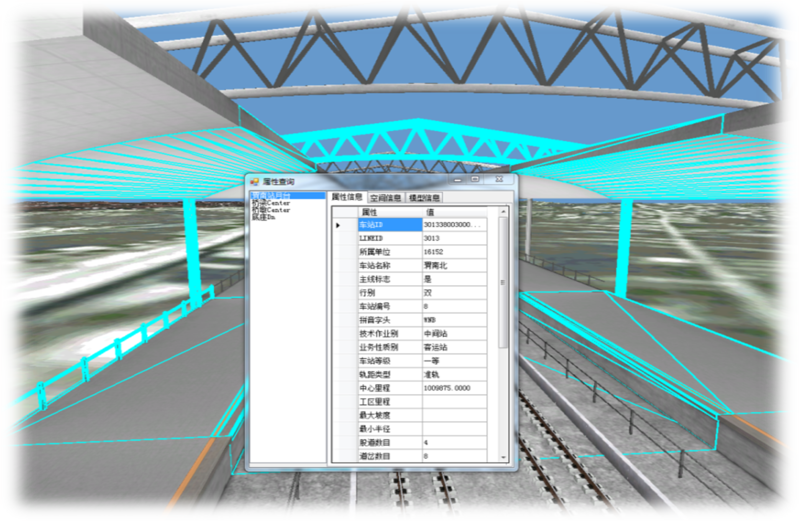 design, construction, operation, maintenance, simulation and analysis), a modelling software system is developed to automatically generate high-fidelity virtual high-speed railway scenes for supporting management decisions and scientific experiments. 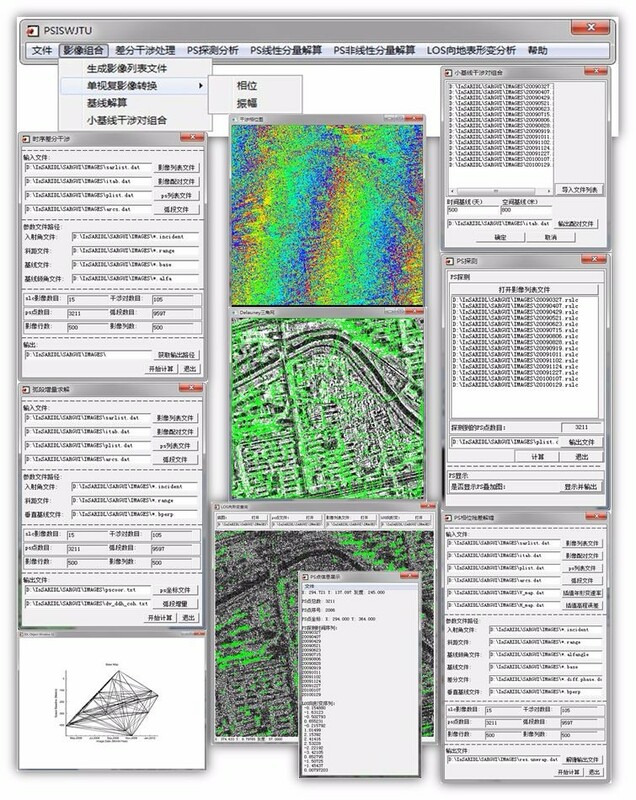 The research work can provide the important theoretical and technical support for interactive display and simulation analysis of geospatial information research achievements. 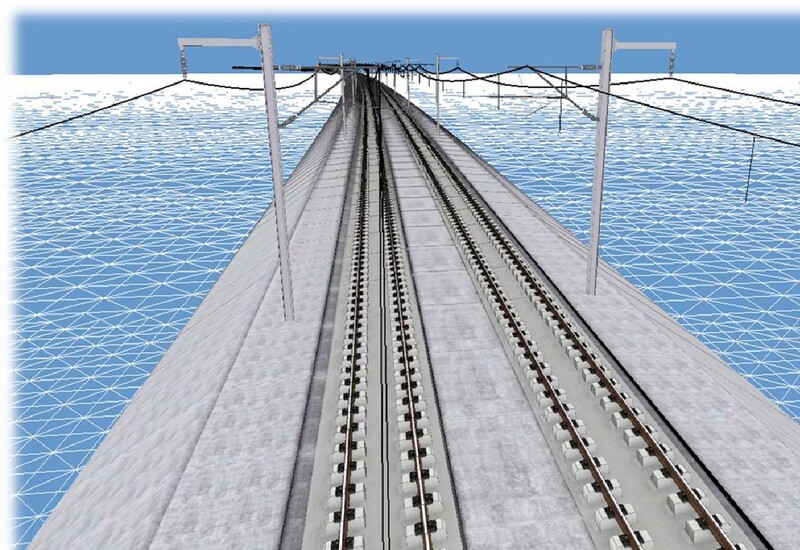 The research center has developed a virtual high-speed railway modelling system, which can be applied to modelling and analysis of virtual geographic environment along high-speed railway, including the virtual simulation line scene, the actual operating line data scene and the running state simulation analysis. 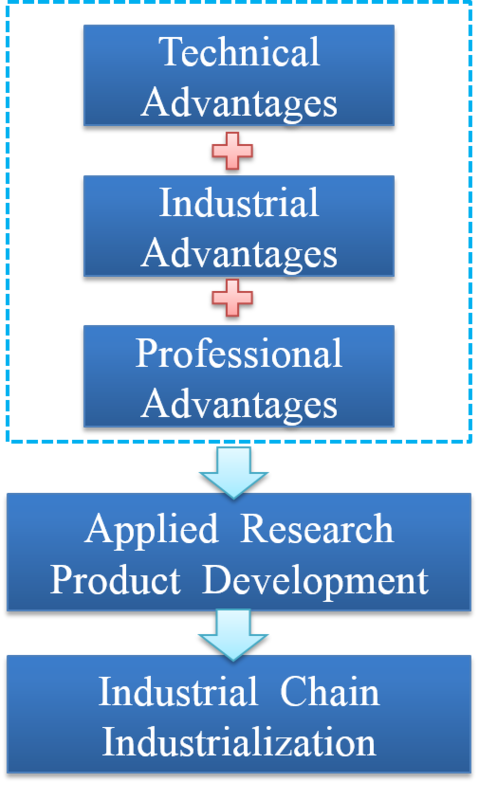 In support of the State-Province Joint Engineering Laboratory in Spatial Information Technology for High-speed Railway Safety, the Research Center for Interferometric Synthetic Aperture Radar concentrates on investigation of the theory and methodology of interferometric synthetic aperture radar (InSAR) and development of the package of relevant software and hardware. 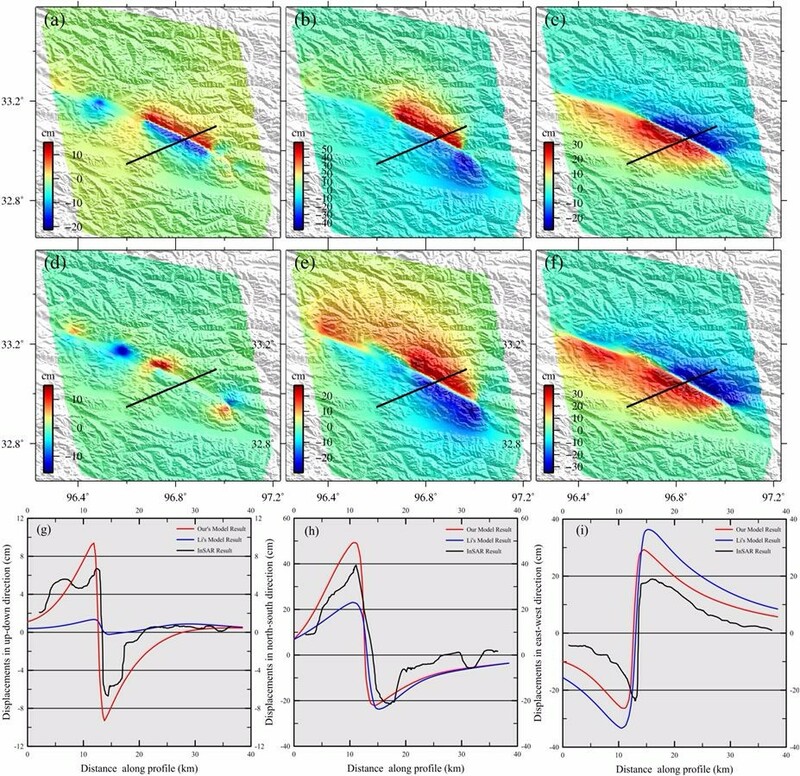 The center also carries out monitoring and analyzing of volcanic motion, glacier movement, landslides, crustal deformation and earthquake, urban subsidence and engineering deformation related to the large-scale linear infrastructures such as high-speed railway. 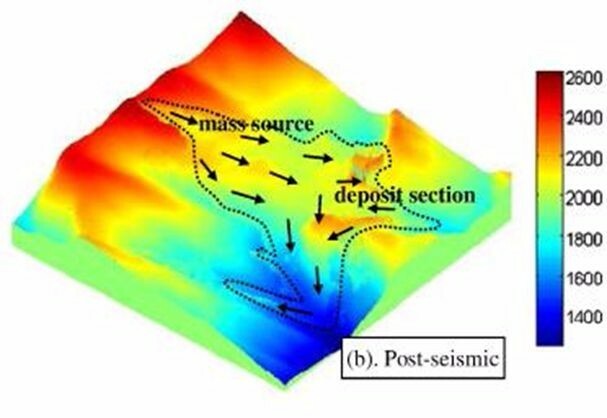 The research work can provide the important theoretical and technical support for the geo-disaster prevention and treatment. 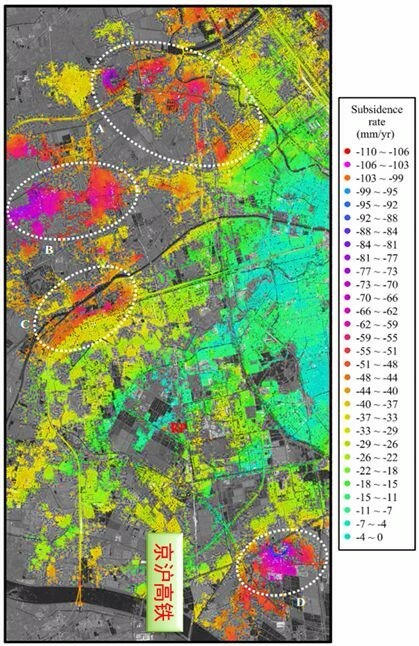 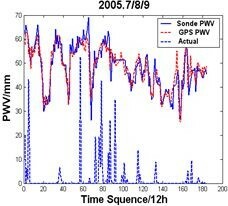 The research center has developed a package of software and hardware of persistent scatterer interferometry (PSI), which can be applied to monitoring and assessing the land subsidence along a high-speed railway, including monitoring of the large-area subsidence funnel and uneven land settlement, as well as the assessment of geometric status of tracks. 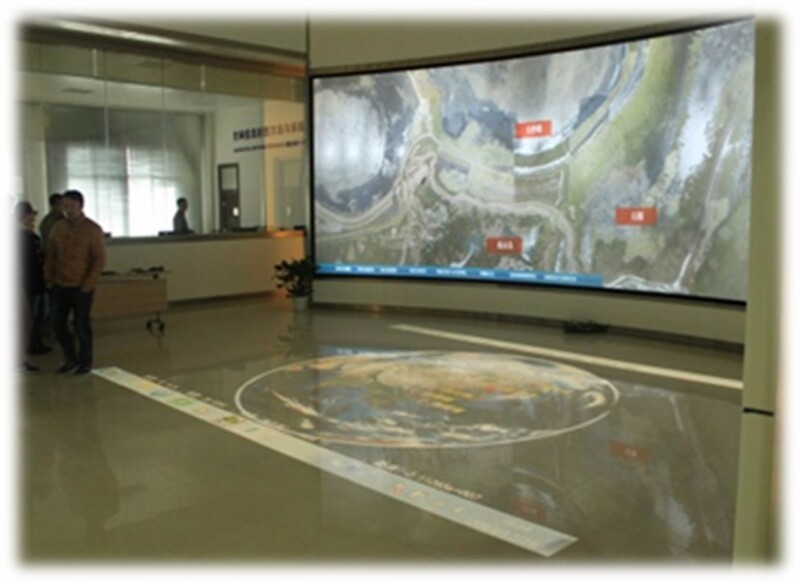 Research center of satellite navigation and positioning (CSNP) aimed at the main targets of promoting applications of new technologies and cultivating professional and high quality talents in the field of satellite navigation and positioning, timing and related geosciences research. 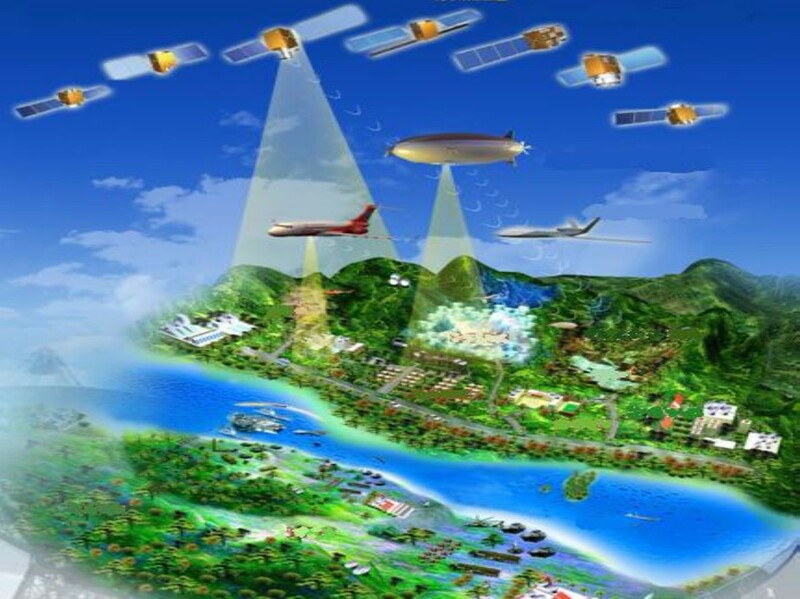 CSNP expand and track international and domestic forefront technology of satellite navigation system, concentrate on the key issues of satellite navigation and positioning, explore and develop new technologies and applications, to build a first-class level R&D and innovation platform for satellite navigation and positioning technology. 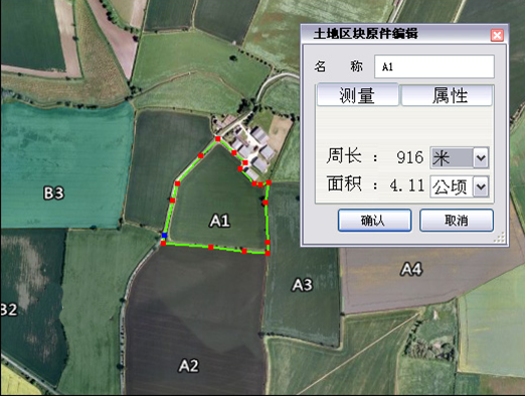 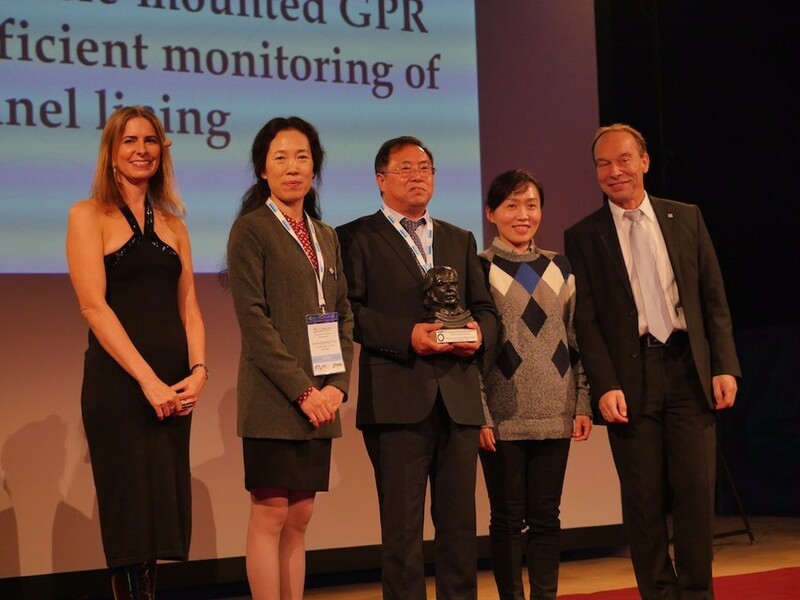 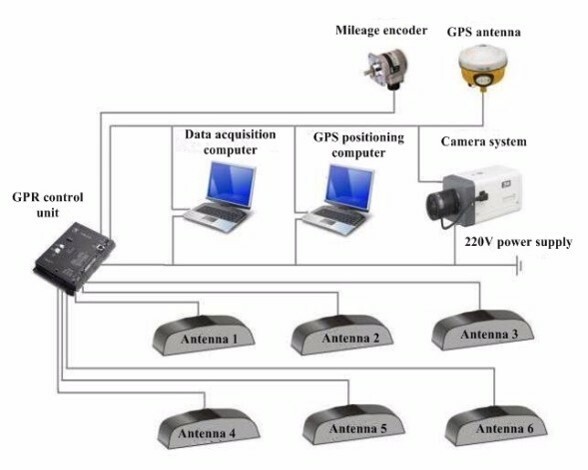 The first domestic GNSS CORS network RTK system is developed with independent intellectual property rights. 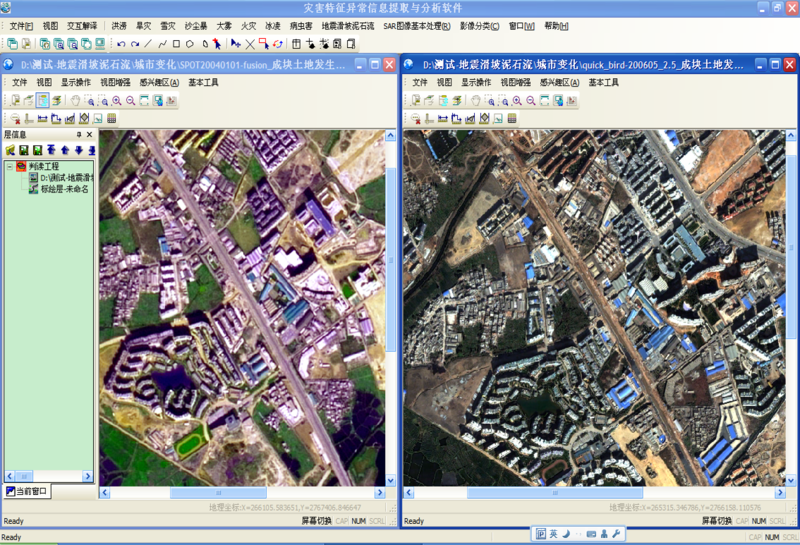 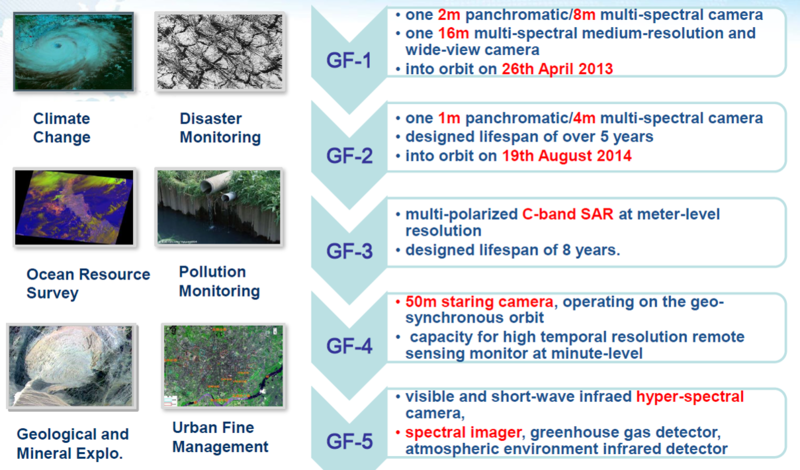 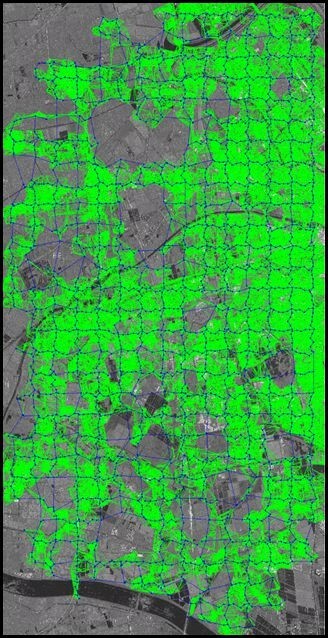 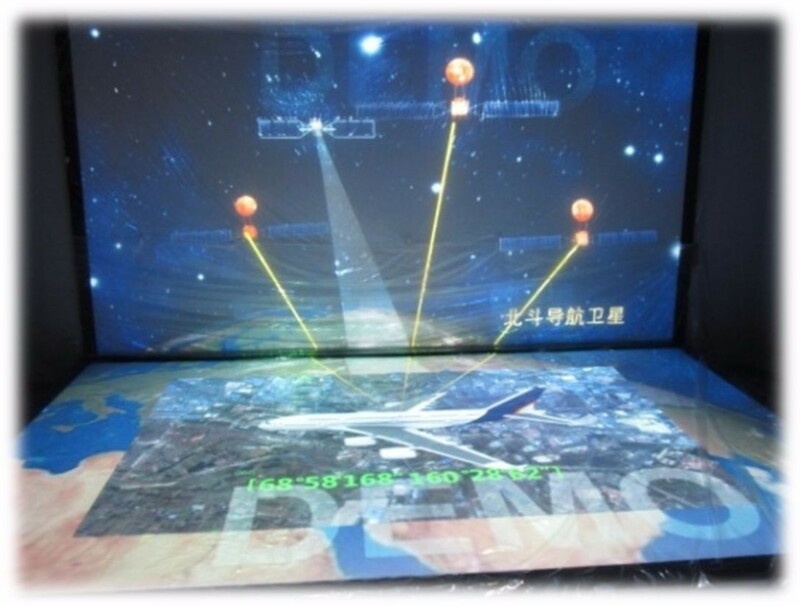 The system supports centimeter-level multi-constellations navigation and positioning for BDS、GPS and GLONASS system. 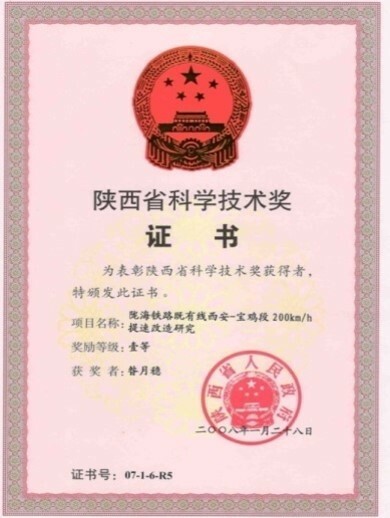 Widely applied in high-speed railway precise engineering surveying，such as Chengdu-chongqing high-speedrailway, Guizhou-guangzhou passenger dedicated railway, Shanghai-kunming high-speed railway, Chengdu-Kunming second-line, Qiongzhou strait crossing engineering, Ethiopian railway engineering survey. 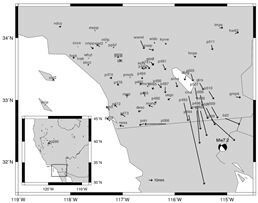 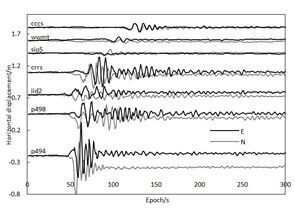 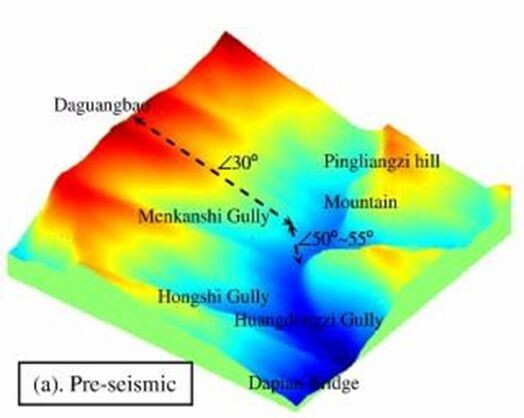 A series of significant achievements have also been gained in inversion of the quake's epicentre, magnitude and failure process with using high frequency GPS data. 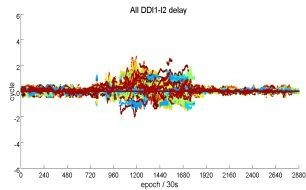 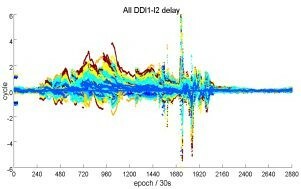 We used continuous GPS observations to determine the 3-D tidal displacement field accurate to the submillimeter level. 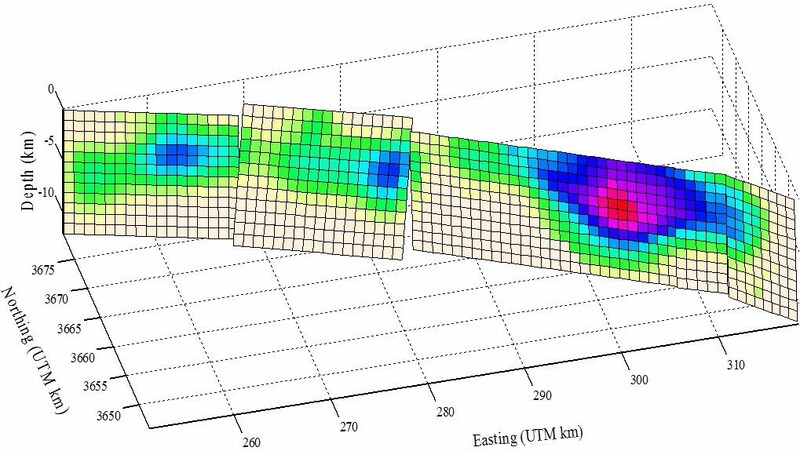 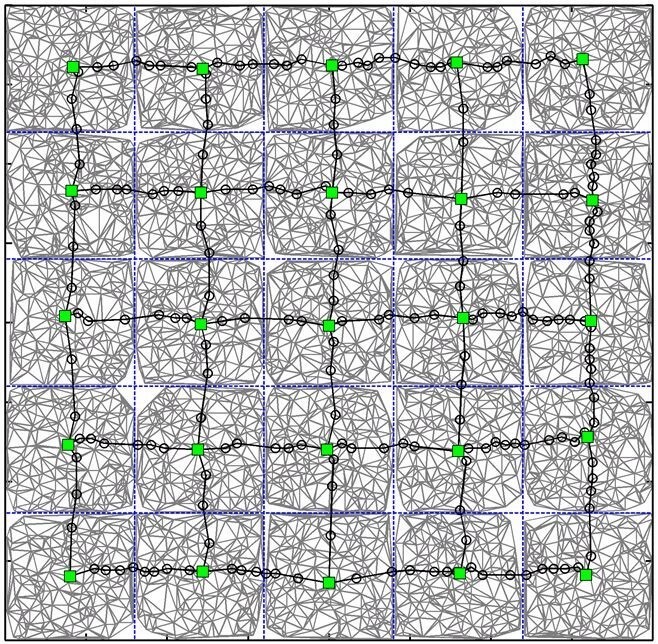 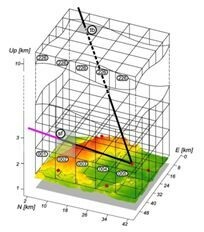 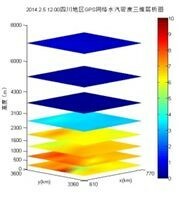 The results will not only provide important constraints to the structure of Earth’s interior, but also refine tidal displacement models for global geodetic research. 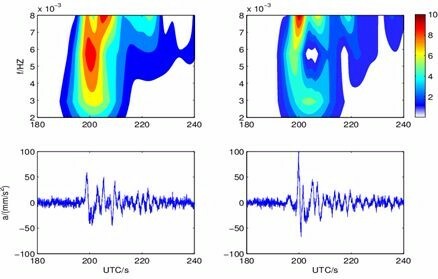 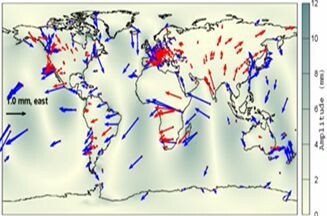 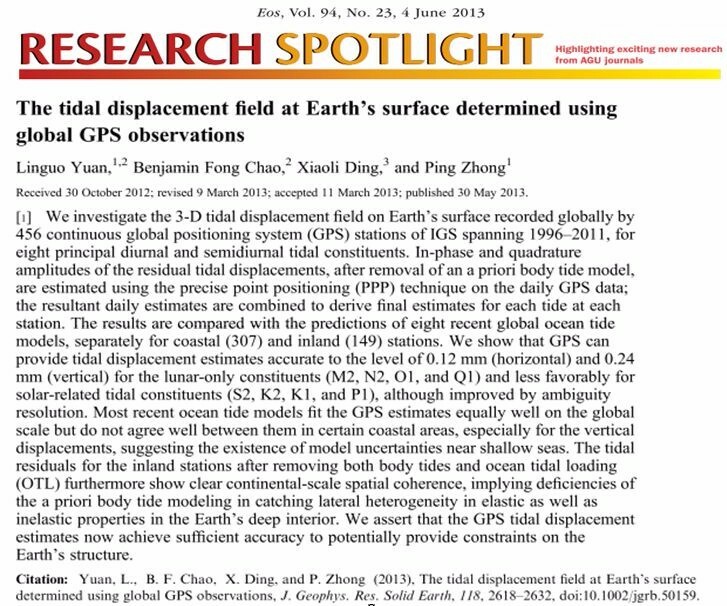 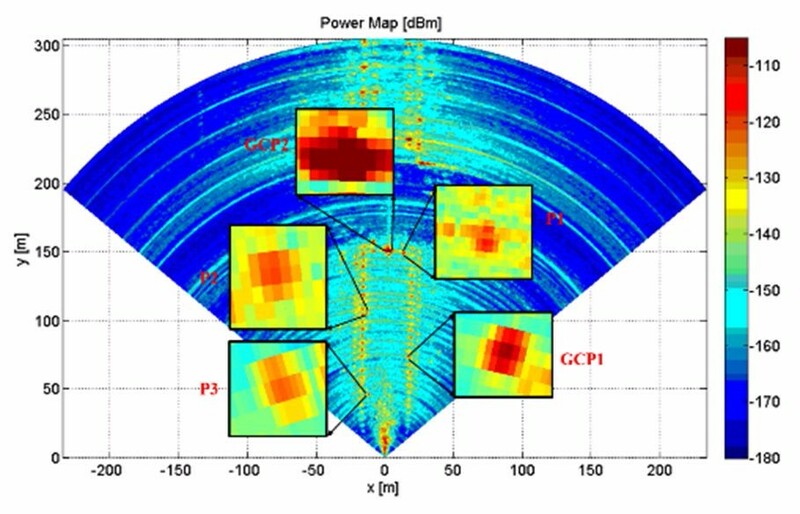 Our JGR paper entitled “The tidal displacement field at Earth’s surface determined using global GPS observations” has been selected as an AGU "Research Spotlight."